Bridge replacement project to begin tentative start date August 1st 2018. Bridge that crosses Traverse Creek near Rt. 30 entrance is scheduled for replacement. Access to Lakeside Lodge & Lakeside Boat Launch can be accessed by Rt. 30 entrance. Access to Roadside Picnic Areas, Modern Campground, Beach Area, Boat & Food Concession use Rt. 18 entrance. Detour signs will be posted to direct park visitors from Rt. 30 to Rt. 18 entrance. Scheduled completion date April 30th 2019. 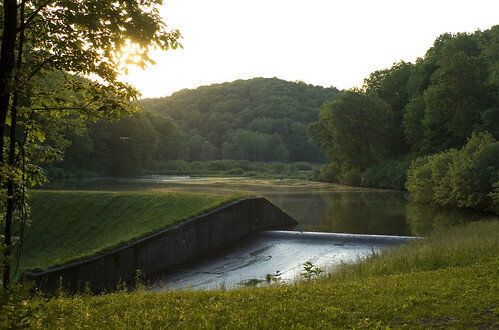 Raccoon Creek State Park is one of Pennsylvania’s largest and most visited state parks. It began as a Recreational Demonstration Area operated by the National Park Service in the 1930s during the Civilian Conservation Corps (CCC) era. The park encompasses 7,572 acres and features the beautiful 100-acre Raccoon Lake. Facilities are a mix of modern and rustic with group camps from the CCC era. Raccoon Creek State Park is in southern Beaver County. Access the park from the east and west on US 30, or from the north and south on PA 18, which passes directly through the park. The Wildflower Reserve contains one of the most diverse stands of wildflowers in western Pennsylvania -- more than 700 species of plants. To learn more, visit Wildlife Watching. Take a hike! The park has 42 miles of trails to choose from. Catch some sun at the beach and stop by the concession for ice cream. Explore the 101-acre Raccoon Lake by kayak, canoe, row boat, or hydrobike. Enjoy a stroll through the Wildflower Reserve. Set up camp in the modern campground. Learn something new by attending an environmental education program. Go fish! Spend a day fishing for trout, panfish, bass, carp, or walleye in Raccoon Lake, Traverse Creek, Raccoon Creek, or the upper lake. Explore the Frankfort Mineral Springs and discover the history of the “healing” waters. Stay in comfort by renting a cabin or the Lakeside Lodge. Take advantage of the almost 7,000 acres open to hunting for small game, deer, and turkey. Curriculum-based environmental education programs are available to schools and youth groups. Teacher workshops also are available. Group programs must be arranged in advance and may be scheduled by calling the Wildflower Reserve Interpretive Center. Programs are offered year round. The center has exhibits and brochures about natural history and historic areas of the park. Contact the Wildflower Reserve Interpretive Center at 724-899-3611 for additional information.